Craft foam is a versatile tool for art projects. Because of its spongy quality, painting craft foam is slightly different from painting other surfaces. 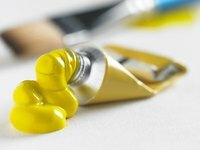 Acrylic paint is the best paint to use when you want to paint the entire surface or a large section of the foam. It spreads easily with a paintbrush and is thick enough that it won't drown the color into the foam. For the maximum color appearance, don’t dilute the paint. And if you plan to mix colors, do so quickly, as acrylic paint dries rapidly. Though acrylic paint is fast-drying, foam takes longer than other surfaces to dry. You likely will need to wait several hours before working with the foam after painting it. If you plan for moisture to touch your craft project, use an acrylic gloss over the paint so that it doesn’t come off. If you want to write words or draw lines or shapes on the foam, fabric paint would work well. It dries slightly raised above the surface. And if you use the right color, it will stand out on top of already-dried acrylic paint. You can use a stencil or cookie cutter to draw your pattern onto a sheet of foam before you paint it. Add texture to it by using a sponge soaked in paint. What Type of Paint to Use on Styrofoam Crown Molding? What Kind of Paint Can You Use on Foam Core Board? What Type of Paint Sticks to Styrofoam?